it's all about FASHION ! My favourite brands include Majolica Majorca, Zara, Jill Stuart, Maquillage, Etude House, Kitschen & Mary Magdalene. Yes, I do love Japanese brands. I found this lass' website through Lowyat Forum. In case you haven't check out the marketplace there, do go now! It's like the best place to shop for stuff from geeky to fashionable items! Anyway, this shopping blog is owned by Linet. 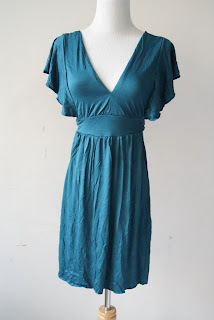 She's a kind lady who sells wonderful pre-loved clothing items. I recently bought a shirt and a dress from her. The shirt and dress conditions are super good not to mention that the dress looks fantastic (on me, tee-hee!)! She has a lot more to offer.... shirts, skirts, pants, bags, you name it. The best thing is, for the quality and style, her stuffs are pretty affordable! Now what are you waiting for? Head on to Purchase These! 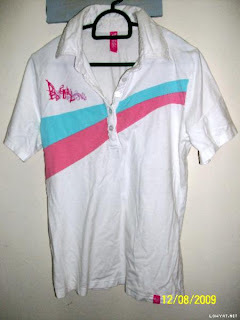 Sweet colored polo tee! Pre-loved at RM15! Ultra cool body contouring dress! Love it! Only cost me RM25! I got this fantastic glitter wand from my friend for my birthday. I want to start by saying how wonderful this glitter wand is. This wand is by Make Up Store, called the Twinkle Eyeshadow in Arrow color. The pigment is amazingly sharp! The rich GLITTER once applied, will stick on you for hours! It doesn't smudge or fade easily. It's water-based so it won't grease your eyelids but is very easy to remove. It's also very lightweight and you can add more than 1 layer for a more glittery effect! 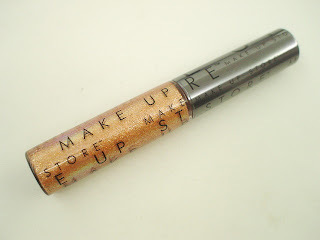 Check out Make Up Store @ Pavilion/Gardens Mid Valley for more glitter colors! Can you see the amount of glitter on the wand? The picture don't do the glitter justice. Try it for yourself! This morning, I went to Mr. K's company to check out some appliances that are on sale. His company is offering discounts to family members and friends. But there's nothing that I want there so I went home after that. 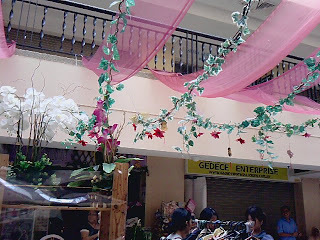 Then, I remembered that there's a bazaar going on at Subang. So, I went there alone and see what they have to offer. 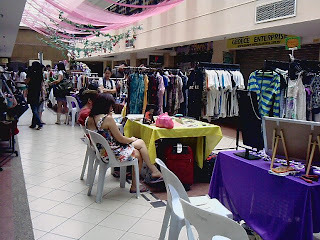 The place is unfamiliar but when you go inside, you can see a lot of clothing stalls. The main attraction I think is the pets stall at the entrance. They sell hamsters, snakes, star tortoises and even a husky!l The stalls are mainly clothing and accessories. Some are handmades. They even have 2nd hand items too! If you are around the area and would like to check it out, please visit this website ! There were about 20-40 booths. The sellers are mostly uni students I assume. The decorations inside the square. Here is where they sell the pets! 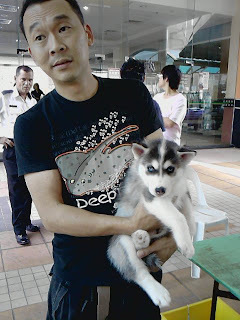 This little husky is only 5 weeks old! Here're my loots. 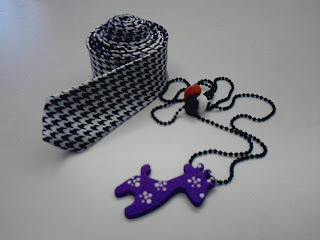 The skinny tie cost RM15 and the purple giraffe is RM7. I was 'forced' to buy these peanuts but hey they taste good! 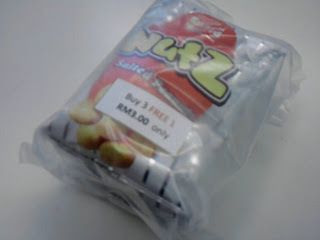 Only RM3 for 4 packs! Bought this at RM35. 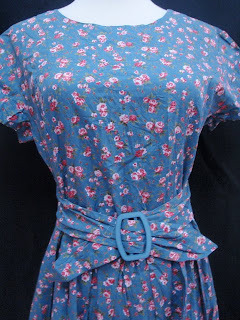 A full maxi vintage dress which I find it quite nice! The seller has a blog too. Check it out! 2 weeks ago I went to a waterpark. Before that, I was contemplating whether to wear my usual swimsuit or to buy a new one. In the end, I decided to buy a new one. I was browsing the internet for recommendations. And I found a very informative website . 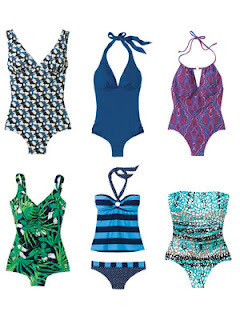 I'm not the usual petite girl with small frame so it's not easy to find a swimsuit that match my body. In the end, I found one which I think is quite ok. It's on sale too and from a good brand. It's a J by Jasper Conran. I've posted the picture here. I shall show some pictures from the waterpark next time! These are recommended for big hips. These are recommended to show a more defined waist. I cannot wear a bikini. And I think wearing one-piece is too boring. This one has a great balance! 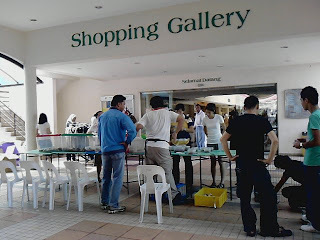 I was spending K's birthday at 1 Utama before I realized that there's a Nose Bargain Sale at the Bargain Corner! 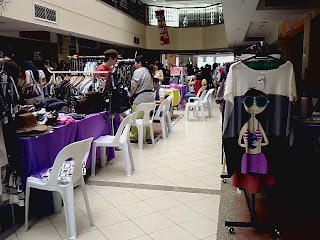 Yes, that's the infamous Bargain Corner that has Nine West's shoes at RM50! Ok back to the Nose Bargain Sale, the best thing about it is, they have tonnes of shoes at my size! I'm a size 8-9. Not only they have my size, the stocks there are hardly touched! It should be the 3rd day of the sale and yet there are still a lot which are still quite good. And guess how much are they? RM10 each for every pair in the house! They aren't a lot of designs left. 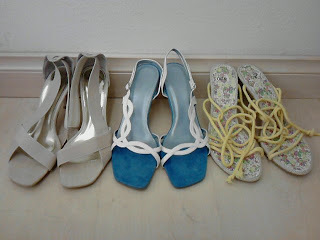 So in the end I got 3 pairs, hehehe~ It could cost RM150 before sale! All in all, I'm happy with my purchase, lalala! My favourite is the ropey one! My colleague bought an auto braiding machine from Perth a long time ago. She never got to use it because it causes her hair to tangle. So she brought it to the office so that I can try it out. The instructions were quite direct and simple. It is, after all meant for teens... or younger. First, put a strand of hair on one end and another strand of hair on the other end. Secure them by releasing the push button (if I remember correctly, there was only 1 button on that machine). 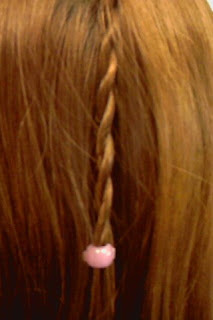 On the same button, press down to start the twisting process, not too long though, cuz it'll tangle your hair! Next, press up again to release your hair from the clams. The box set even came with colorful beady hair clips. Secure the braid with a clip. Voila, I look like a brat in her teens again! And the effect is quite amazing. It's the first time I seen such a machine so I'm quite amazed by it. Now I want one for myself! 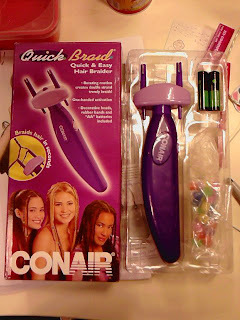 The brand name is Conair. Not too sure if they are available locally. A close up view of the braiding effect. 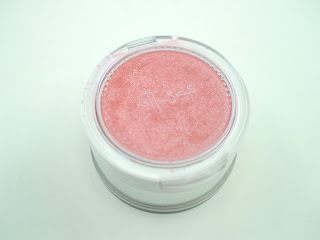 Got this uber cute blusher from the Shiseido's drugstore brands' warehouse sale at Summit. I know that Ettusais (pronounced as Ettu-say) is not really a drugstore brand as it has counters at Isetan Gardens Mid Valley and KLCC but somehow the brand's products ended up there. 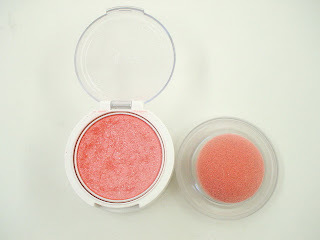 This blusher has small lamé beads and a very smooth texture. The color is just right as it is not too dramatic or too light when applied. At first I was feeling a little skeptical because it looks matte and I avoid matte blushers at all cost. 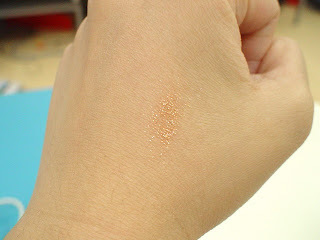 It was quite a pleasant surprise when the effect was silky with a little shimmer ^_^. It also comes with a cute puff, which is attached at the bottom of the case. The puff can be washed and reused. There's one thing that needs to be careful of though. Normally, for me, I will apply my blusher from near the nose upwards to the apple of my cheeks in circular motions. 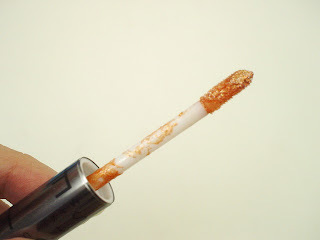 But if I use this method with the blusher, the color will become too intense, producing a 'Chinese Opera' effect! So, the trick is to dap the puff lightly on the cheeks instead. And guess how much it cost? RM25. Yup it's a bargain~! The retail price should be about RM60-70! Oh yea, you can buy the refill to save up on the casing cost! Check out Ettusais SG (no Malaysian site available) for more info. Quite a dandy casing. I like Ettusais' clean but cute packaging! This is my online shop to sell off some clothes and makeup. Some are impulsive buys and some are just because I'm bored of them. My lose, your gain ^_^ For your information, I'm a size UK12 (sometimes UK14 :P).